When looking at the aerial photograph below what do you see? Consider the different shapes and what they might be. Is it a large or small scale image? Does this knowledge change how you perceive certain shapes? Is the image taken directly from above or at an angle? Are there any shadows? Is there any variation in tone? How are different features related to each other? These are the questions a photographic interpreter or imagery analyst would ask when studying an aerial image in order to extract useful information from it. Shape refers to the general form, configuration or outline of individual objects and is normally the first thing the eye sees in an aerial photograph. In many cases it provides immediate identification, however many objects have a similar shape. A circular object could be a gas holder, a chimney, a well or a roundabout, depending on its size. By comparing the feature to a recognised object - if the object is a well it would be smaller than a house, for example. By measurement - if the scale of the image is calculated, the exact size of the object can be determined. Shadows can reveal the profile or outline of an object, and are useful for determining its shape, height and construction. The relative brightness of objects in an image is described by the term 'tone'. Tone is related to texture and colour and is the measure of the amount of light reflected back to the camera by an object. The colour of an object has less effect on tone than is generally expected. The smoother the surface of an object, the greater is the amount of light reflected back to the camera - this is why a black asphalt road may appear lighter than a green field of grass. Note the difference in tone between the canals, streets and houses in this image of Amsterdam. In images of arable land, subtle tonal variations can highlight differences in drainage and vegetation. Objects can often be identified by looking at their surroundings. In the identification of the circular objects referred to in 'Shape', above, a gas holder would be sited adjacent to a gasworks, a chimney would be sited within a factory and a roundabout would be situated at a road junction. In the identification of military features in the field, the main associated features are tracks, emplacements and trenches. 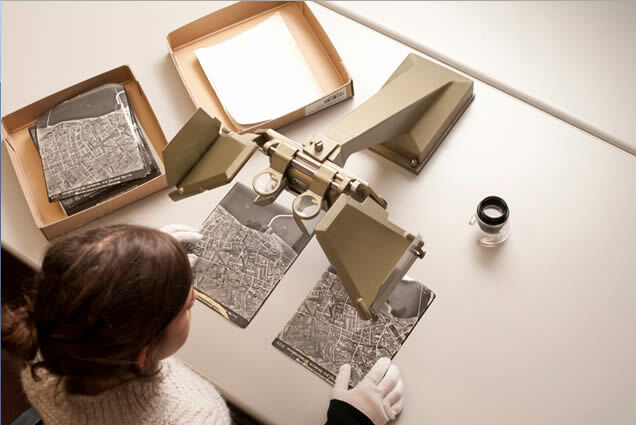 A three-dimensional impression of the features depicted in an aerial photograph can be obtained by viewing two correctly oriented, overlapping images with a stereoscope. A stereoscope is a binocular optical instrument which allows the viewer to look at two photographs simultaneously, so that features which are not noticeable in 2-D to appear to have relief. Aerial survey photographs normally have an overlap of 60% along the line of flight, to permit stereoscopic viewing.